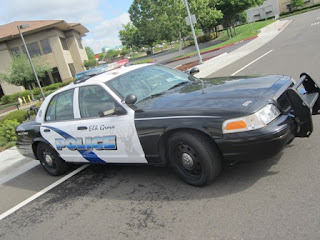 Elk Grove Police arrested two boys ages 14 and 15 yesterday afternoon on suspicion of a daytime residential burglary. At 2:30 officers were dispatched to the 5500 block of Adobe Springs on the city's northwest side regarding an in-progress burglary. The resident indicated that the two suspects involved had fled the scene and provided a description. Officers arrived at the residence and discovered that a side garage door had been kicked in. The two suspects from Sacramento and Elk Grove were located a short distance away. Both suspects were taken into custody then transported to juvenile hall. On Monday, Elk Grove Police arrested two juvenile suspects for an attempted daytime residential burglary.